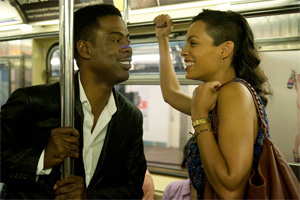 Chris Rock comes close to hitting his stride in Top Five, a new comedy about an alcoholic comedian who’s trying to establish himself as a serious actor. In his third directorial effort after I Think I Love My Wife (2007) and Head of State (2003), Rock finally finds a vehicle that brings some of the smarts, raunch, social insight and bravado of his stand-up routines to the big screen, along with enough vulnerability to protect him from accusations of undue vanity. In this outing, Rock — who directed and wrote the screenplay — portrays Andre Allen, a stand-up comic who finds a niche (and an enlarged bank account) in Hollywood playing a character called Hammy the Bear, a cop in a bear suit who mows down criminals with his automatic weapon. The Hammy movies are enormously popular, but Allen’s sick of making them. That’s why he ignores the advice of his agent (Kevin Hart) and pushes himself into a new arena with a serious movie called Uprizing!, the story of a 1791 Haitian slave revolt. The poster features a bearded Allen brandishing a machete. Of course, Uprizing! is on track to bomb, thus thwarting Allen’s attempts at reinvention. Rock’s screenplay mostly follows Allen around New York City as he meets with a variety of indignities on his film’s opening day. Rock doesn’t miss the opportunity to take a few nicely placed shots at movie-biz hype — an easy but ever-ripe target. Rock’s character’s last name is Allen, and his fans want him to return to his funny stuff. Sound like anyone you can think of? Allen spends a fair amount of time walking and talking in Manhattan, but the humor and tone of Top Five is light years away from Woody Allen, who never got down and, yes, dirty, the way Rock can. A fair amount of the movie’s humor tends toward the raunchy and ribald, notably a bit in which a Houston hustler (Cedrick the Entertainer) introduces a visiting Allen to couple of hookers. The encounter devolves into what Allen describes as the low point that finally got him off the sauce. I won’t give away any of the other gags, but there’s an amusing bit that suggests an even better movie, one that’s more conversational than crude. Visiting the Brooklyn neighborhood that spawned him, Allen meets up with Tracy Morgan and a variety of others who create the riffs that give the movie its title. They’re trying to name the top five hip hop artists. Rock builds his slender story around a running bit: A New York Times reporter (Rosario Dawson) wants to write a profile about Allen, who hates the Times for having panned all of his movies. Pressured by his manager, Allen reluctantly agrees. Rock and Dawson generate sparks of antagonism and potential romance that suggest something more than a reporter/source relationship with Dawson matching Rock step-for-step. Did I mention Allen’s engaged? Gabrielle Union orbits the New York story: She’s in LA, a blatant striver who has arranged to marry Allen as part of a reality show to be aired on Bravo. Draw your own conclusions about the hot sauce gag, which is better discovered in theaters. Many will regard it as a comic high point. I didn’t. But rapper DMX singing his version of Smile made up for it. There’s also a moment in which Allen finds himself in a choke hold administered by a New York Cop, an unintended evocation of recent events. Don’t look for a structural masterpiece: Rock builds his loose-limbed comedy around a variety of bits with a few serious moments added to make Allen’s struggle with alcohol and desperation more plausible. Although Rock appears in nearly every scene, he bolsters the movie with lively cameos from Kevin Hart, JB Smove, Whoopi Goldberg, Adam Sandler and Jerry Seinfeld. Judging by the movie’s cameos and by its ending, it’s safe to say that Rock has a deep respect and love for stand-up and the people who do it. It’s tempting to wonder where Rock’s movie career goes from here. Like his main character, Rock might be most comfortable with an audience in front of him and a mike in his hand. In that environment, he’s sharp, smart, savvy about pop culture, and unworried about giving offense. He’s a comic with honesty and conviction, and in Top Five, he frequently comes across that way.